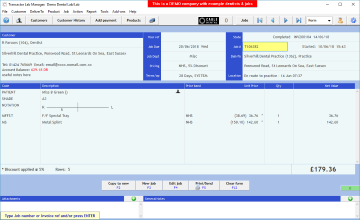 Transactor V8 is computer software for dental laboratory administration, which runs on Windows computers and tablets (see system requirements) and online via the Cable Dental service. Transactor keeps track of your customers, jobs, products, invoices, payments and technicians. Transactor gives you all the tools you need to easily produce documents such as delivery notes, invoices, statements, financial reports, job and technician tracking reports. The Cable Dental online portal allows you to view the last 3 months of Transactor jobs in a web browser, for Cable registered dentists, and via the same portal dentists and practices can send you jobs electronically, straight to your desktop. Both parties can add or adjust details, add file attachments and even correspond online. Jobs pass in and out of the lab at various stages of their job life cycle, in some cases booked in and booked out several times before ultimately being ‘Booked Out Completed’, at which point documents such as an invoice and patient statement may be automatically printed. Jobs coming into the lab are ‘Booked-In’ to Transactor V8’s Main Form and stored as job records. These are uniquely identified by a job number and/or a multi-purpose reference. Job records can be retrieved (recalled onto the Main Form) by scanning a barcode, entering a job number, reference, patient name or from the customer’s history. To find out more see the Coffee Break Tour. Automatic or manual printing, and direct emailing is supported for job tickets, job labels, quotes, delivery notes to dentist, delivery notes to practice, credit notes, invoices. Reports include statements, summary invoices, price lists, jobs booked in (all or by due date), work by technician, sales by category, and many more. This is combined with flexible printing options such that you can get barcoded documents or labels automatically printed when you perform given actions. For example, some labs will want a delivery note and a patient statement automatically printed when the job is completed but perhaps not when a job is booked out as an ongoing treatment. It is a daunting prospect for a lab and dentist trying to track lab jobs from start to finish. However Cable Dental does just this – tracking dentist’s lab jobs from start to finish. Cable Dental provides a simple and well organised framework for both technicians and dentists, which ultimately delivers a seamless case pathway from the dental practice to your lab and back to your happy customer. Complete satisfaction – Try the free trial!